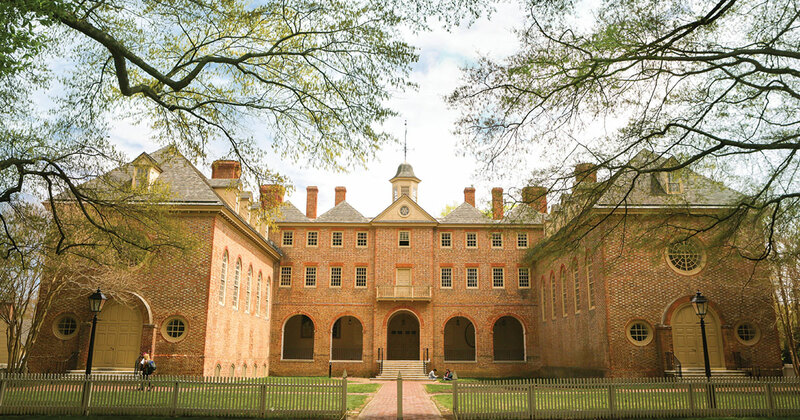 William & Mary Hall — home to hundreds of Tribe sporting events, concerts and ceremonies every year — is taking the name of two of the most generous benefactors of the university, Jane Thompson Kaplan ’56 and Jim Kaplan ’57. The Board of Visitors approved a measure today to change the building’s name to Kaplan Arena, in honor of Jane and Jim’s unwavering commitment to advancing excellence in the classroom and on the basketball court. Jane and Jim Kaplan are among William & Mary’s most loyal basketball fans and fixtures in the arena that bears their name. But the Kaplans’ support of Tribe basketball extends well beyond their cheers in the stands. The Kaplan family legacy has been built on their long record of advancing causes they are most passionate about, including scholarships support for students committed to excelling academically and athletically at William & Mary. Over the decades, Jane and Jim have empowered many gifted student-athletes to lead lives of remarkable achievement by opening the doors of opportunity through scholarships. Their most recent scholarships gift — which was given during the leadership phase of the For the Bold campaign — is the largest the Athletics Department has ever received and will provide full financial support for generations of men’s basketball players. “I cannot think of a more appropriate name on the building the athletics department calls home than Kaplan,” reflected Tribe Athletics Director Terry Driscoll. “Jane and Jim were among the first people I got to know when I first arrived to Williamsburg 20 years ago and in that time, I have not met more dedicated fans or better and more caring people. The leadership and resources they have provided will have a positive impact on an untold number of future William & Mary student-athletes. I am personally thrilled to know the Kaplan name will have a permanent and prominent association with our department." They are also dedicating a significant portion of their gift to fund the Muscarelle Museum of Art expansion project — a priority in the For the Bold campaign. A new wing of the museum will also be named in their honor. “The Kaplans are the model of alumni giving and participation. Jim and Jane's gift will transform one of the foundational origins of the College, the arts, and enable the Muscarelle to expand its world-class exhibitions and programs,” added Aaron DeGroft ’88, director of the Muscarelle Museum of Art. The Arena first opened its doors in 1971 and is home to the Tribe basketball, gymnastics and volleyball teams. It also hosts university events such as Commencement and the Charter Day ceremony as well as trade shows, large academic conferences and concerts. Musical acts that have performed in the Arena include Bruce Springsteen, The Police, the Beach Boys and Ludacris. It also hosted luminaries such as Prince Charles, Lady Thatcher, President George H. W. Bush and the Dalai Lama. While the Arena seats 8,600 people for athletic events, capacity can be expanded to fit a total of 11,300 for large concerts and other functions. It’s not a coincidence that the Kaplans have had a vested interest in supporting students involved in the William & Mary basketball program. In fact, Jim received a full scholarship in the 1950s which made his decision to attend William & Mary and play basketball an easy one. If not for the scholarship, he would have likely gone on to play for the Michigan State Spartans. During his time at William & Mary, Jim performed remarkably in the classroom and on the court. He earned the role as captain of his team and three-year starter, scoring a total of 863 points. In 1987, decades after his victorious run, Jim was inducted into the W&M Athletic Department’s Hall of Fame. According to Jim, his scholarship provided him with the means to pursue his passions both on and off the court. It also allowed him to attend the very institution where he met his future wife, Jane. For Jane, William & Mary is a big reason why she has been so inspired to give back. “Our parents taught us to give back, but it has been such a great experience. We’ve gotten much more out of it than we have given,” added Jane. Together, Jane and Jim have served on nearly 10 different boards, committees and foundations at William & Mary, spanning over 15 years. Both currently sit on the Campaign Steering Committee and each have been recipients of the Alumni Medallion, the most prestigious award given to alumni for their professional accomplishments, leadership, dedication to the community and commitment to their alma mater. The Kaplans are also very devoted to William & Mary's Catholic Campus Ministry, of which they are generous benefactors. One of their four children, James Kaplan, received his M.B.A. from the Raymond A. Mason School of Business in 1992 and their grandson Jamie is in the Class of 2017.